Subramanian Swamy’s Islamophobic outbursts in the July 16th edition of DNA did not come as a surprise to many. The maverick always displayed a knack for hogging the limelight throughout his political career. For many years now had been displaying an extreme anti-Muslim attitude despite having close professional as well as family relations with Muslims. However, this was not always the case. 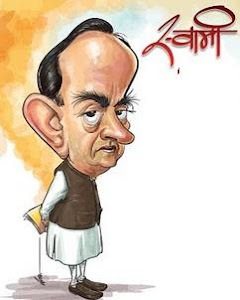 As late as the early to mid-90s Swamy was the most vocal critic of Hindutva. Lest anyone, including Swamy, has any doubts about this we only need to go as far as 1993. On March 13, 1993 Swamy gave a speech at the Madina Education Centre in Hyderabad on the topic, “Demolition of Babri Masjid and Aftermath.”A verbatim transcript of the speech was published in the April, 4-11, 1993 issue of The Anti-Corruption and was also brought out as a booklet by Madina Publications. A comparison of the DNA article with this speech reveals how radically his views have changed in the short span of 18 years. In that article Swamy had stated that RSS, VHP, BJP, and other affiliates are not ‘pro-Hindu’ but ‘anti-Muslim’ organizations. ‘After the Babri Masjid demolition, the first thing we must do, is to disabuse the minds of the people, that RSS stands for Hindus…they have vulgarized the name Hindu, like Hitler, in the name of nationalism, vulgarized the meaning of nationalism,’ he had stated. ‘In Mizoram outsiders cannot buy land. In Arunachal you cannot buy land, there are so many states where you can’t buy land,’ he continues. Swamy calls for removal of Gyan Vapi mosque and the construction of temples on the sites of 300 other mosques. In the 1993 speech he had stated that the Hindutva forces rake up the issue of Kashi Vishwanath and others to ‘collect crores of rupees for it.’ He had then also stated that the ‘Ram Lalla Mandir must be demolished, because it is not a mandir, it is built on sin, it is built on treachery. It is built on deceit, it is not built according to Agama Shastras.’ As a way of getting out of the deadlock he had supported the view of the Babri Masjid Action Committee that it be resolved by independent enquiry committees. Swamy’s ideological journey has made many twists and turn over the years. That would have been inconsequential in another age. But in the current atmosphere of violent Islamophobic hate, as is evident most recently from Norway, hateful rhetoric can very easily lead to violent action against minorities. It is heartening to know that Swamy’s fulminations have been condemned a cross-section of the society. At the same time it is sad that one strong votary of peaceful coexistence has transformed himself into a merchant of hate. BJP,is a ‘pro-Hindu’ but ‘anti-Muslim’ organizations. SWAMIJI WHAT ARE YOU TALKING ABOUT YOU JUST WASTING OUR TIME AS WELL AS YOURS PLEASE WRITE SOMETHING MEANINGFUL AND INTERSTING DON'T WASTE OUR TIME. Subramanian Swamy is generally known for his maverick nature and lack of sensible thinking. Islamic law is absolutely incompatible with democracy. It is a theocratic system with Allah alone at its head. Allah's law is interpreted by a ruling body of clerics. There is no room for a secular political system in which all people are treated as equals. Do any body know how much money spent by India Govt. center (Congress) and states for only minority Muslim religious community in a year more then 50000 million and for Hindu's of many religious communities 1 million. Chidambaram is the 'biggest' ISI mole!